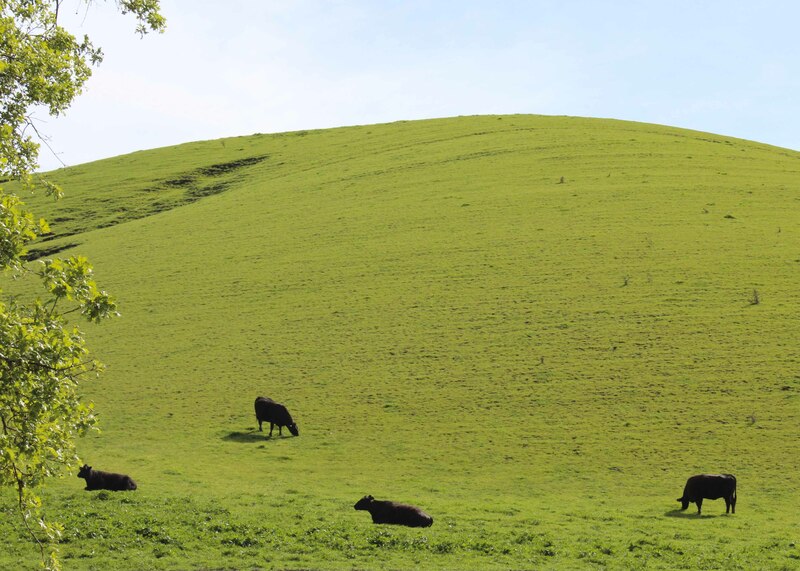 Cows grazing on grass, their natural food. Sean Croxton, of the Underground Wellness Show, has a saying that I love—JERF—Just Eat Real Food. That sentence alone says the essence of what we need to know about food and healthy eating. I asked Sean if he minded my using an acronym so similar to his, and he graciously told me to go for it. Sean’s saying has inspired me to come up with my own acronym—JEG—Just Eat Grassfed, which contains the essence of what we need to know about eating meat. Here are a few examples of the wisdom of JEG. Want to avoid residues of the artificial growth hormones that are common in factory meat? JEG—Just Eat Grassfed. Want to avoid ingesting antibiotic residue in your meat? JEG—Just Eat Grassfed. Want to avoid ingesting steroid residue used to make conventional cows grow faster? JEG—Just Eat Grassfed. Want to avoid getting a huge imbalance of omega-6 fatty acids in your meat? JEG—Just Eat Grassfed. Want to get a healthy dose of omega-3 fatty acids, in perfect proportion to omega-6 fatty acids? JEG—Just Eat Grassfed. Want to get a healthy dose of CLA, a valuable fat that reduces inflammation, aids weight loss, and enables the body to fight off many inflammatory diseases? JEG—Just Eat Grassfed. Want to avoid the risk of getting Mad Cow disease by eating meat? JEG—Just Eat Grassfed. Want to avoid eating meat from an animal fed huge amounts of GMO corn and GMO soy? JEG—Just Eat Grassfed. Want to avoid eating meat from an animal that was fattened on candy bars, chicken manure, rendered restaurant waste, plastic balls, candy wrappers, chicken parts, chicken feathers, and all kinds of similar garbage? JEG—Just Eat Grassfed. 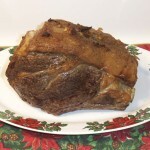 Want a roast that has not shrunk to half its original size when it is done? JEG—Just Eat Grassfed. Want a steak that does not have to be cooked at super-high heat? JEG—Just Eat Grassfed. Want to enjoy lamb that tastes of the pasture rather than the feedlot? JEG—Just Eat Grassfed. Want to enjoy bison that tastes like bison instead of factory beef? JEG—Just Eat Grassfed. Want to enjoy beef in a multitude of local flavors, instead of standard feedlot flavor? JEG—Just Eat Grassfed. Want to eat meat from an animal that has lived its life on pasture, and has never been in a feedlot? JEG—Just Eat Grassfed. Want to eat meat that tastes wonderful even when cooked with only a few ingredients? JEG—Just Eat Grassfed. Want meat that never makes you feel stuffed or bloated, but makes you reel refreshed and renewed? JEG—Just Eat Grassfed. Want to eat a food that will nourish the natural functions of your body, giving strength, and helping your body recover from injury or illness? JEG—Just Eat Grassfed. Want to support the raising of animals who actually create good soil and farmland? JEG—Just Eat Grassfed. Want to eat the oldest food of humankind, the food our bodies know how to use and benefit from more than any other? JEG—Just Eat Grassfed. Want to eat the tastiest, healthiest, most satisfying meat on the planet? JEG—Just Eat Grassfed. The Michigan Massacre continues. Heritage pigs are being slaughtered, down to the last baby piglet. The farmers who own these pigs are forced to kill them, or watch them be killed by DNR agents. If they fail to cooperate, or resist, they face years in state prison and a felony conviction, along with huge fines. These farmers are having their herds destroyed without trial or hearing, losing their livelihoods without compensation. It is not only the pigs that are being massacred in Michigan, it is our liberty. Due process means a fair hearing, with the right of appeal, except in the most dire emergency circumstances. And domestic farm animals, including heritage pigs, are property. Heritage hogs behind a fence are not that kind of emergency, not by any means. What due process did the Michigan pig farmers get? There was no trial, no hearing of any kind, no right of appeal. The kill-all-pigs order did not even come from the state legislature. Instead, the Michigan Department of Natural Resources issued a regulation. A regulation that is totally insane. A regulation that demands the extermination of almost every breed of pig in the state, based on how they look, including all heritage breeds raised by small farmers. This applies even when the pigs are behind strong fences, with no chance of escape. Oh, but the pigs in the CAFOs (Concentrated Animal Feeding Operations), raised in confinement, are not affected by the regulation. The Michigan Pork Producers Association used its lobbying power to block an attempt in the state legislature to delay the implementation of the regulation. In other words, big corporate hog farms are not affected, while small farmers raising heritage pork will have all their pigs killed, without compensation. What “due process” do the small farmers get? Several carloads of armed DNR agents, who show up at their farm giving the farmer the choice of killing all their pigs or being charged with a felony that could put them in state prison for years. The fact that the agents may have a warrant is not due process. This is the same kind of process used in every totalitarian dictatorship, from Nazi Germany to Soviet Russia to East Germany to North Korea—those armed thugs had papers as well. Liberty is dying in Michigan this month, while the federal government and the Michigan government do nothing. If corporate America is allowed to destroy the production of real food by influencing state regulatory agencies, there will be no real food. 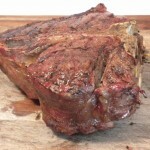 Super-Tender Double Bison Chop, nicely browned on the outside, with a very rare interior. When I was a child, I had an illustrated copy of an old story, Hans Brinker and the Silver Skates. The story tells of a young Dutch boy from a poor family, who is a great skater. More than anything, Hans wants to win a race that had a pair of silver skates as the grand prize. Hans wanted those skates more than anything. While Hans was preparing for the race, his father had a serious injury. The doctor (this was back in the days when doctors actually made house calls and treated poor people who could not afford them) said that only good food, including rich red meat, would enable Hans’ father to recover. But Hans’ family was too poor to afford meat. Hans won the race, and the silver skates. He then sold the skates he had wanted so much, and used the money to buy good food for his father, including beef. The father recovered from the good food and grassfed beef. Most of the versions of the story today have the money used to pay for surgery, but in the version I had, meat was the key to healing. That story has always stuck with me. The power of grassfed meat made an important change in my life recently. There was a very nasty illness going around, and I caught it a couple of weeks ago. Normally I do not catch anything, but I got this. I was not getting enough sleep at the time, and I am sure that was part of it. But I soon became sicker than I had been in thirteen years, with a very nasty, deep cough that fed on itself. There was one four-day period when I slept a total of seven hours. It was very difficult to eat. How can you use food to fight an illness if you have difficulty in eating? I tried a number of things, various home remedies, sunbathing, sipping an ocean of broth, and prayer. The one thing I did not do was use doctors or medication. I have found them to be useless for this type of illness. Eventually I was able to stop the cough and the other symptoms. But I was totally, completely worn out. I was tired all the time, and did not want to do anything. My body ached all over, the way it used to feel after an afternoon of being pounded on a football field. Sleeping did not really seem to help. I was able to eat (though my appetite was greatly reduced), but I remained tired. This went on for day after day. Finally, my birthday came. We had a grassfed bison roast to celebrate, and I cooked it very rare, using the Super-Tender Double Bison Chop recipe in Tender Grassfed Meat. 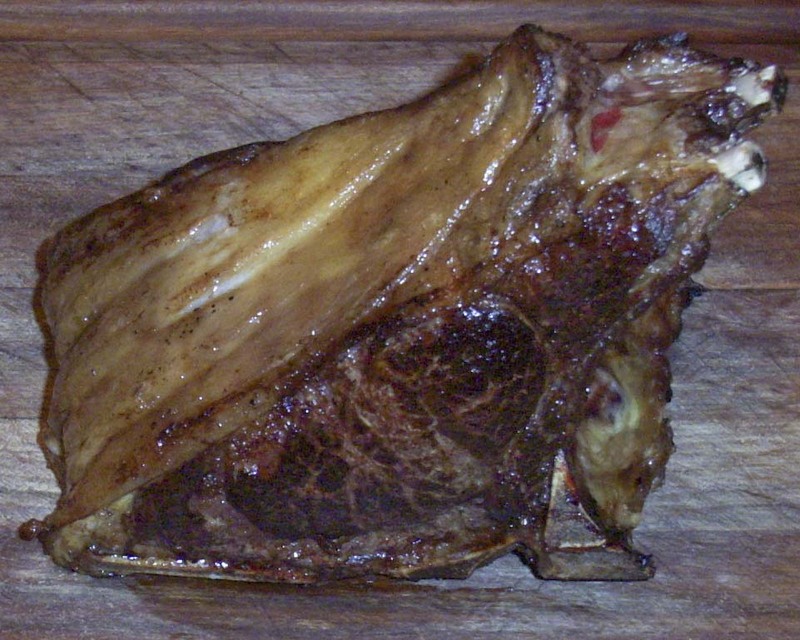 The meat was cooked so rare that the natural enzymes were not denatured. The very first bite I took of the tender red meat created a great hunger in me. My whole body was demanding more, more, more! I slowly and carefully ate slice after slice of the delicious, juicy meat. And I started to feel energy flowing back into my body. I started to feel good and energetic. By the time that meal was over, I was no longer tired. I awoke the next morning full of energy, and completely myself. I was totally well. I have since made sure to regularly eat some serving of very rare grassfed beef, and I am doing great. So what happened? Almost all of the healthy peoples studied by Dr. Weston A. Price ate some of their meat raw. Raw meat has a number of enzymes that are deactivated if the meat is cooked beyond a certain temperature. There is an old saying in Germany that beef gives strength. And eating some raw meat is an old tradition in Germany. Many European and Native American cultures believed that eating meat would help healing. Based on these traditions, and my own experience, it is clear that there is something in raw or very rare grassfed bison and grassfed beef that can renew a tired and damaged body. I do not know exactly what it is. I just know that it worked a miracle for me. What it actually did was give the natural functions of my body the nourishment they needed to restore my health and energy. Our bodies are amazing, and can heal almost anything if they get proper nutritional support. Now, our government is totally against the eating of raw meat, and very rare meat, claiming it is unsafe. This is the same government that allows animals that are so sick that they cannot stand to be processed into meat, something no traditional society would ever do, unless they were starving. Obviously, the government intended these standards to apply to factory meat. I cannot stand to eat factory meat, anyway. But I personally feel fine if I am eating very rare beef or bison from healthy animals, raised and finished on grass. While I am not personally opposed to eating raw meat from healthy, grassfed beef, or bison, I have never been able to get myself to eat raw meat. But I love very rare grassfed beef and very rare grassfed bison. I am not advising anyone else to eat as I do, merely relating my experience. Everyone must decide for themselves. And my experience was that eating very rare grassfed bison was exactly what my body needed to regain its normal energy and vitality. Most of us believe that all ingredients will be listed on the label when we buy a food. After all, the USDA and the FDA are there to make sure our food is safe, and that we know what is in our food, right? Wrong. Food labels do not contain many of the ingredients that have been added to the food. The federal agencies allow a host of chemical additives to be added to packaged foods, without labeling. As long as the amount of the ingredient is below a certain percentage, it is not required to be listed on the label. This has led the food and chemical industries to develop a number of chemicals that are so strong that even a tiny amount can have a dramatic effect on the food. Since the amount used is so small, the ingredient need not be labeled. In addition, ingredients added to packaging are not labeled as an ingredient, since they are considered to be part of the packaging, not the food. But these ingredients are in direct contact with the food, and get into the food. Many products labeled as “organic” may not actually be organic. Rather than making our food safe and informing the public of ingredient content, the mission of the federal agencies seems to be to protect the profits of the large food industry at all costs. This is apparent if you look at what they actually do, rather than listening to what they say. The only solution I have found is to buy as much of my food as I can from farmers and ranchers I know and trust. And to buy local whenever possible. I do not trust food labels, but I do trust real food, as raised by the farmers I know and trust. The food industry has developed a number of preservatives, sweeteners, and flavor enhancers that are so powerful that even a tiny amount will have a huge effect on the food. None of these compounds occur in nature, and all of them have been developed in a lab. Many new ones are developed and added to food every year. Because they are so powerful, they can be added to food in amounts so small that they do not have to be labeled. Yet no one really knows what effect long term use of these substances will have on the human body. Do you want to be a guinea pig for the food and chemical industries? I do not. But you cannot rely on labels to protect you from being a guinea pig for these artificial, lab-made substances. The ingredients in the packaging are not labeled, either. For example, many kinds of food packaging have nanites added. But you will not find nanites on the label. If you think nanites sound like something out of a science fiction novel, you are right. Currently, they are incredibly tiny particles that are used to kill bacteria in food. What will these tiny particles do when they get into the human body? Will they kill the beneficial bacteria we all need to digest food and be healthy? Will they enter our cells and damage them because they are so tiny and can penetrate cell walls? Will they interfere with the vital functions of organs like the heart, lungs and kidneys by penetrating them? All these concerns have been raised, but there are no clear answers, and no long-term testing. Once again, we are guinea pigs without even knowing it. In addition to nanites, BPA and many other chemicals are added to food packaging. BPA and other chemicals have been shown to interfere with human hormones. But you will not find them on a label. GMOs are not labeled, either. In Europe, the presence of GMOs must be placed on food labels. But not in the U.S. In fact, I have yet to see a single label that discloses the presence of GMOs. GMOs are plants that have been modified by biotechnology to have certain characteristics, usually a heightened tolerance to pesticides. They do not occur in nature and are designed in a laboratory. Most people do not want to ingest them. Yet almost all non-organic packaged foods contain GMOs. Almost all food animals are fed GMO crops as feed. If you eat a conventional diet, you are getting plenty of GMOs in your body. Finally, the feed and chemicals that have been used to raise a food animal are not on the label. Factory beef, for example, is usually raised with artificial growth hormones, artificial steroids, non-therapeutic antibiotics, GMO corn, GMO soy, and can contain a number of other “feeds” that are approved by the government, including chicken manure, processed restaurant waste, candy bars, and many other ingredients that no ordinary person would ever think of feeding to cattle. But none of these substances is on the label. But Can You Trust Organic? You should be able to trust the organic label. It means that everything in the bottle or package is organic, without pesticides or chemical additives, right? It should. But it doesn’t always. The label “organic” now means that only ninety-five percent of the ingredients must be organic, with the other five percent coming from an approved list of non-organic materials. If it says “100% organic,” then everything in the box or package is supposed to be organic. But is it? Again, not always. A lot of organic food comes from foreign countries, particularly China. The safety of food from China has been a subject of controversy for years. Food safety outbreaks have happened in China so often that the government has actually shot people who were deemed responsible for tainting food. China has generally not allowed foreigners to inspect food plants in China, so most of the food that is certified organic is inspected by a Chinese company. Many people have raised concerns over whether organic food from China is actually organic, or contaminated with pesticides and chemicals. This issue became particularly identified with Whole Foods Market, the giant multi-billion-dollar grocery conglomerate. Whole Foods used to get most of its organic foods from China. After an ABC news story in 2008 that questioned whether foods from China were actually organic, a huge controversy broke out, with Whole Foods steadfastly insisting that its organic food from China was in fact organic, while critics claimed it was impossible to adequately verify whether food sold in China was actually organic. In 2010, Whole Foods announced that most of the organic fruits and vegetables sold under its 365 label would be purchased from countries other than China. However, it was unclear whether other foods sold under that label such as sauces, condiments, etc, had organic ingredients that were not from China. The issue of whether foreign foods labeled “organic” actually are organic has risen in regards to foods from other foreign countries besides China. So what is true? I do not actually know. But, since avoiding pesticides and chemicals is very important to me, I do not buy organic food that does not come from the United States, or Canada, or the European Union. I am familiar enough with their certification programs to believe they are usually enforced, whereas I just do not know about the standards in the other foreign countries. I prefer not to take the risk. I also like the idea of supporting local farmers, and food from foreign countries is the opposite of local, especially when it is shipped thousands and thousands of miles from China. 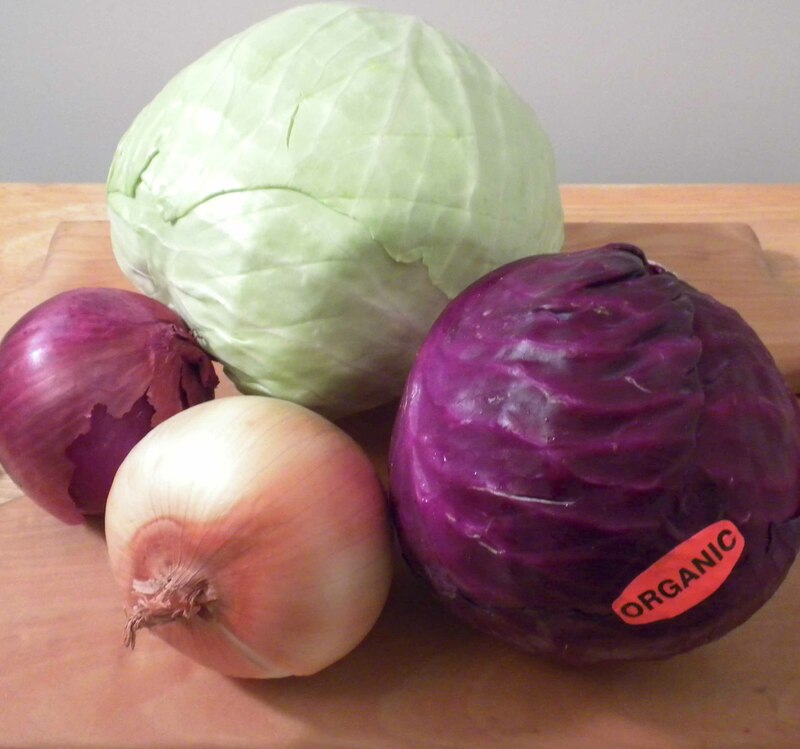 Another problem with organic foods in the U.S. is the packaging. The packaging can contain various chemicals that can enter the food. For example, even organic tomatoes can have BPA in the lining of the cans they come in. For this reason, I only buy organic foods that come in glass jars, as I think they do not have chemicals added to the glass. Because of the many problems with labeling, along with the widespread use of chemicals and pesticides by the food industry, I have found that the best solution is to buy as much food as possible from local farmers and ranchers I trust. It is worth getting to know the people you buy food from, to understand their values, and to feel that they are raising the kind of food you want to eat. In this case, the use of organic farming techniques, often called the equivalent of organic, is much more important than certification. Organic certification can be very expensive, and some of the best farmers cannot afford it. There are many great farmers and ranchers out there, but there are some who have lower standards, and it is crucial to know your farmer. It takes some time and effort, but I have found it to be worth it, as the food my family eats is so important to me. This post is part of Monday Mania, Fat Tuesday, Real Food Wednesday. and Freaky Friday blog carnivals. As interest in Paleo and Primal Diets continues to expand, one question continues to come up—what did our Paleo period ancestors actually eat? While there is no conclusive answer, we can be assured that one food was right at the top of their list—bone marrow. Bone marrow is a soft, fatty substance found inside bones. It contains all the nutrients and substances that the body uses to build, repair, and maintain the living bones, from the inside out. There are a number of caves that show long evidence of human habitation, going all the way back to the Paleolithic period. All of these caves contained ancient fire pits. And all of these caves contained the remnants of large piles of bones. The bones that were found were animal bones. Almost without exception, they had been cracked open, and every trace of the marrow removed. This is the most direct evidence we have of what Paleo people actually ate. Wild animals also value bone marrow. Large predators will crack open the bones of their prey, and eat the marrow. Hyenas, which are scavengers rather than hunters, have incredibly powerful jaws that are perfect for cracking even large bones open so they can get at the bone marrow. The healthy peoples studied by Dr. Weston A. Price also valued bone marrow, when they could get it. Some would crack open the bones and eat it raw, most would simmer marrowbones in their broths, and others would extract the marrow and use it in all kinds of dishes. Bone marrow was an important component in traditional European cooking, with many different ways of preparing it, some of which were quite complicated. Marrow dumplings were a favorite throughout central Europe. Dr. Price once designed a diet for a group of very poor children who went to school at a mission in Canada. These children were of native background, and usually ate modern, cheap, high-carbohydrate, high-sugar foods. They had terrible teeth, poor attention spans, stunted growth, and all kind of health problems. They did very poorly in their studies. The school did provide lunch. Dr Price devised a lunch plan for them that centered largely around a meat dish he designed. This dish contained a large amount of vegetables and meat broth, and a substantial amount of bone marrow. Broiled rare meat was finely chopped and added to other ingredients. Not only did the children’s teeth and health improve substantially, but they began to excel in their schoolwork. There is a recipe for my version of this dish on page 120 of Tender Grassfed Meat. Old-time physicians would prescribe eating bone marrow to strengthen the teeth and bones, to recover from injury, and relieve rheumatism and other bone problems. 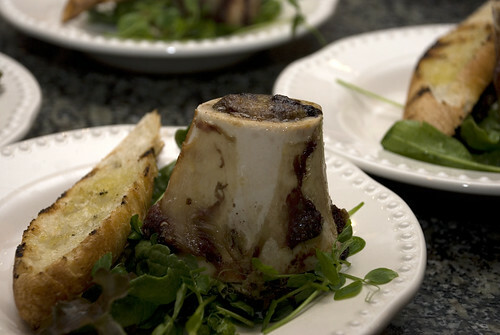 Most people are intimidated by the thought of cooking bone marrow, but there is an easy solution. My friend, Sarah Pope, of the Healthy Home Economist blog, has come up with a method of cooking bone marrow that is so easy and delicious that it defies belief. Here is a link to Sarah’s video that explains her easy method and demonstrates it. You will not believe how easy it is. Sarah likes to serve it on toast, which is traditional in Europe, but you do not have to eat grains to enjoy this most nutritious and delicious of foods. 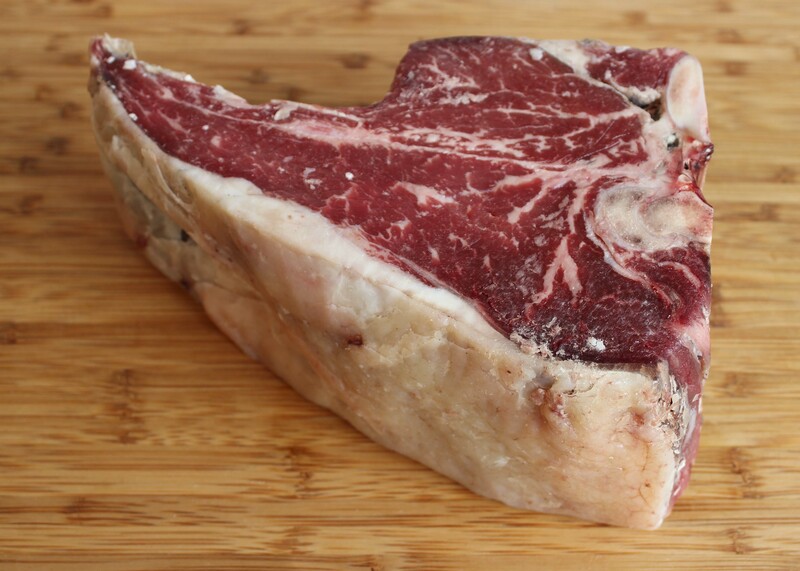 You can eat it right out of the bone, with a small spoon (there used to be spoons designed specifically for this purpose), or you can spread it on a nice hot piece of grassfed steak or roast, which was also a tradition all over Europe. This is so delicious that I do not even know how to describe it. And bone marrow is one of those foods that really satisfies, being loaded with nutrients. I only recommend bone marrow from the bones of grassfed animals. This was the kind of marrow our ancestors ate, and I have always found grassfed animals to be totally superior when it comes to nutrition and taste.